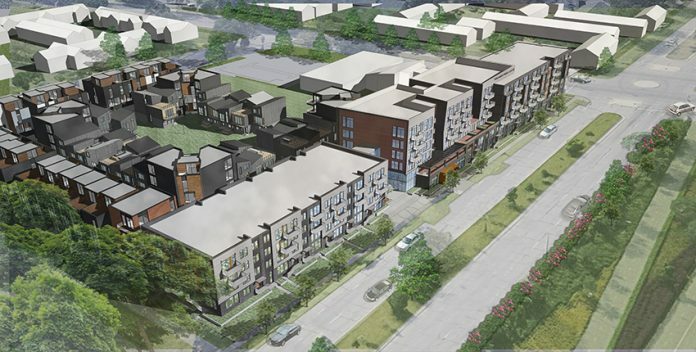 Site preparation will begin on Pullman Parc, a four-acre residential development planned for Detroit’s Lafayette Park, Detroit’s Broder and Sachse Real Estate, Farmington Hills’ Hunter Pasteur Homes, and Southfield’s Woodborn Partners announced today. The development will feature 81 townhouses, carriage homes, and corner flats for sale, as well as 180 apartment units for lease. The for-sale residences are expected to be available starting in early 2019 and the apartments are slated to start preleasing in late 2020. Demolition of structures currently on the land will be underway at the end of the month, and construction is expected to begin in early 2019. Hunter Pasteur Homes will build out the townhouses and flats with architecture by Chicago’s Studio Dwell and Boston’s Merge Architects. Broder and Sachse is overseeing the development of the apartment units alongside Woodborn Partners. Broder and Sachse has developed a series of multi-family and mixed-use properties throughout Detroit, while Woodborn Partners developed The Coe at West Village. The apartments will be known as The Renato at Pullman Parc. Detroit’s Sachse Construction is the construction manager, and BKV Group Inc. of Minneapolis is the architect of record for the apartment units. “This is a historic neighborhood of Detroit on the rise, and we’re planning an exceptional housing development that meets the need for more residential options outside of the city’s central business district,” says Richard Broder, CEO of Broder and Sachse. Lafayette Park is located just east of I-375, and the planned development is located near downtown Detroit’s stadiums, theaters, restaurants, and shopping, as well as Belle Isle and Eastern Market.